I should not have waited as long as I did to see this. Bored with his dull suburban life, aspiring songwriter Jon (Domhnall Gleeson) stumbles upon a grand opportunity when an experimental indie band, Soronprfbs, is in sudden need of a keyboardist. Though the gig does not go particularly well, Jon earns the attention of Soronprfbs’ masked frontman, Frank (Michael Fassbender). Jon is invited to join the band, much to the chagrin of Frank’s girlfriend and band theremin-player (thereminist? ), Clara (Maggie Gyllenhaal). 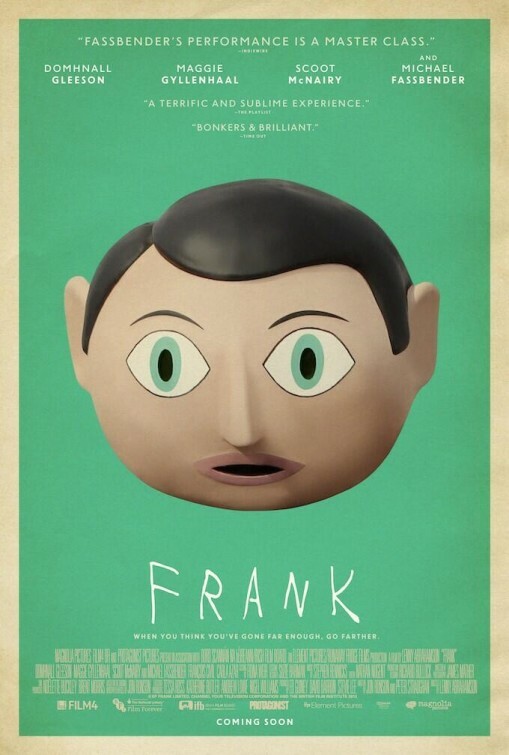 As a film, Frank serves almost as an inside look as a achieving art, or perhaps more of the perception of becoming of artist. Throughout the quirks is a story of anguish and expression, with Jon as an apt creative everyman. This is a story of fame versus respect, combined with the internet celebrity zeitgeist – wrapped up in a musical shell. From Jon’s perspective, his venture with Soronprfbs is not unlike a trip to Oz – even with the ending, but I won’t spoil anything. Pretty much everything. I’m thinking about getting the soundtrack, even. …I’ve got nothing. Maybe the use of social networking will age terribly in the next few years, but that’s about it. It goes without saying that Michael Fassbender is fantastic (as if that’s a surprise anyway); his performance as Frank is wrought with sincerity and a sort of delicate tact. Really the whole ensemble works wonderfully – I really just enjoyed watching them play together and jam. Posted on July 11, 2015, in Netfix and tagged art, dark comedy, dramedy, Michael Fassbender, music. Bookmark the permalink. 1 Comment.